Home » Wiki » How to use Portable Gas Detector? Safety confirmation must be made before entering the working area. After taking corresponding safety protection measures, such as the mask, gas mask (depend on specific application scenarios) , confirm to guarantee the safety of testers and prevent potential safety hazards, then operators can detect in the working area. When the gas detector gives an alarm, operators should leave the working area immediately and keep the detection data. After more than half-hour of forced ventilation, secondary detection and measurement can be carried out again. Detectors should write the work site and detection results on the confirmation form, and take full responsibility for the accuracy of the detection data. 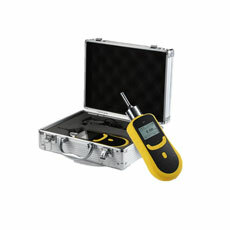 Place the probe of portable gas detector in the tested environment. When there's a gas leakage, the data of concentration displayed becomes larger, and the alarm indicator lights up while giving the alarm sound when the gas concentration exceeds the setting value of alarm. When the probe moves to the leakage source, the data displayed on the concentration display screen of the gas detector increases and the reading is recorded. When the portable gas detector gives a low power warning, that means the battery is running out of power. At this time, please turn off the power in time and charge the battery with a charger for 10-14 hours each time. Improper usage methods of the portable gas detector would reduce its measurement accuracy, and it's a careful work to improve the measurement accuracy of the gas detector. Many parts shall be adjusted, so as to ensure the measurement accuracy. Charging method: insert the power charger into the AC 220V power socket and insert the charging plug into the charging socket of the detector, then turn on the four-in-one power switch of the gas detector to charge the detector, the green light turns on and the battery indicator flashes, the display screen shows “----”. After completing the charging, turn off the power switch and pull out the charger. The harmful gas detectors have their respectively fixed detection range, and they can only measure accurately within the measuring range. Long-term measurement beyond the measuring range may cause permanent damage to the sensor. Regular calibration of the instrument is an indispensable work to ensure the accuracy of measurement, whenever the probe is replaced, the instrument must be calibrated again besides the activation time of the sensor. Moreover, it is suggested that the response test of standard gas should be carried out before the instruments is used, so as to ensure the accuracy and effectiveness of the instrument.